School finance reform could bring the privately operated public schools a windfall. But traditional public school advocates are still fighting the charters' expansion. When the yellow-scarf-wearing coalition of “school choice” supporters held their biennial rally at the Texas Capitol this January, the crowd was smaller than in years past. One reason: Some of the state’s largest charter districts had pulled out of the fanfare that frosty winter day, deciding to distance themselves from the advocates pushing for private school vouchers or similar programs. "We backed out," Mark DiBella, CEO of the Houston-based YES Prep charter, said plainly. "I basically wanted to put as much distance between us and vouchers as possible given the nature of the feeling in Austin." Funded by the state but managed privately by nonprofits, charter schools have held a unique political position in Texas, allying with voucher advocates under the broad "school choice" umbrella while also lobbying lawmakers to shell out more for public education. 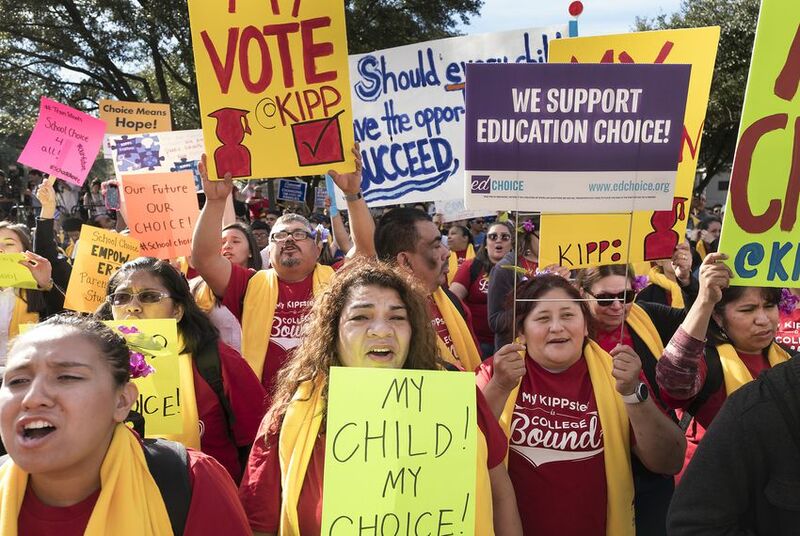 The decision to avoid the rally was emblematic of a larger strategy charter leaders appear to be using this legislative session as the political winds shift away from subsidizing private school tuition for Texas parents. As lawmakers discuss putting billions more into the public education system for the first time in years, charter advocates are leaning away from their association with private schools and leaning into their similarities with traditional public schools — while seeking the resources to educate the growing number of families wanting to enroll. But the embrace is in many ways one-sided. Many traditional public school advocates remain wary of charter schools and their impact on traditional school districts, and they’re continuing to fight the growth of charter schools in every venue they can. "Folks who normally align against vouchers, charters, other kinds of programs like that or policies like that, don't have anything else to oppose besides charter schools," said Starlee Coleman, CEO of the Texas Charter School Association. "There's nowhere else that they need to train their fire." In 2017, charter advocates celebrated a historic win: first-time state funding to lease and maintain instructional buildings. And this year, they appear poised for a windfall. The House has nearly unanimously backed a proposal to put billions of dollars into public schools, and the Senate is pushing for $5,000 raises for the state’s full-time teachers. Since charter schools get the average school district funding per student, they're likely to get more money in any proposal to increase spending on public education. They also have more economically disadvantaged students than the statewide average and would benefit from legislative efforts to direct more money to predominantly low-income schools. Texas is one of the largest charter authorizers in the country, with 171 charter districts in operation. This school year, just under 6% of Texas public school students are enrolled in charters. But that percentage creeps higher in some major cities, which can be home to dozens of charter schools. And while the number of new charter districts has slowed to a trickle in the last few years, existing charter districts have been rapidly opening new campuses around the state. But any gains charter schools make are sure to generate pushback from superintendents, board members and teachers unions at independent school districts, many of whom see state-spurred growth of the schools as an encroachment on their student enrollment, state funding and freedom from private control. Traditional public schools sometimes lose millions of dollars due to declining enrollment as students leave for nearby charters. "We have a small handful of very aggressive chain charters who are building schools, in many cases right across the street from a traditional public school where there is not the need for additional capacity," said Louis Malfaro, who heads the Texas chapter of the American Federation of Teachers, one of the most ferocious charter critics. "They were supposed to be labs of creativity. They've become franchises." Parsing the differences between the two types of public schools can get tricky. Charter critics will point out that charter schools get more state funding than most urban school districts and contribute to the underfunding of traditional school districts. But charter advocates counter that they are not allowed to levy local taxes in order to raise any additional revenue, so they need even more state money to match traditional school funding. A letter signed by dozens of charter districts last month urged lawmakers not to take any money or flexibility away from their schools and students and to "support a level playing field" for both charters and traditional public schools. Charter critics have the backing of certain lawmakers, including Rep. Mary Gonzalez, D-Clint, who has filed a bill that would place a moratorium on new charter schools and a bill requiring additional notification for school districts before charters open up schools nearby. The House Public Education Committee will take up her notification bill Tuesday morning along with dozens of other charter-related bills, some of which charter schools oppose. Gonzalez said she is concerned Texas is building two parallel systems of public education "with different amounts of funding and different levels of transparency and different guidelines around accountability." It's not clear how much traction the charter regulation bills will have this session, however. Charter advocates say they're not too worried. "Charters are going to continue to be OK at the Legislature," Coleman said. "Generally speaking, we have a broad enough bipartisan coalition in the House and Senate that largely will prevent anything existential happening to charters." Much of the public opposition to charter schools over the last year centers on a 2017 law incentivizing school districts to partner with charter schools to overhaul chronically low-performing schools. The law requires school districts to hand over authority of those low-performing schools to charters in exchange for extra money and a reprieve from state sanctions. That didn't sit well with teachers unions in those districts and vocal factions of communities invested in those low-performing schools, which are more likely to be low-income and majority black or Hispanic. In Houston, a proposal last April to partner with a charter to improve its struggling schools sparked fierce outcry at a board meeting that ended in multiple arrests — leading board members to retreat from the idea. In San Antonio, two teachers unions filed a lawsuit against the state, arguing the law effectively weakened protections for teachers and prioritized charter growth over the wellbeing of traditional public schools. Advocates for traditional public schools fought against their competitors in other ways, too. A few school district leaders got caught pressuring their vendors not to do business with charters, prompting the Texas attorney general to chastise them in a formal opinion. Superintendents and board members in Dallas and San Antonio urged their city councils to block charters from being able to open new schools. Charter advocates are supporting a bill this session by state Rep. Joe Deshotel, D-Beaumont, that would prevent municipalities from using permits or zoning to limit charter expansion. DiBella, of YES Prep, attributes the local tension to a handful of bad actors among his fellow charter leaders who have been caught embezzling money from their schools or failing to provide a quality education for their students. "They are by far the exception to the rule, but they get portrayed as though they're representative of the whole movement," he said. "I stand firmly behind high-quality charter schools, and I'm firmly against low-performing charter schools not doing right by kids." He sees the public relations battle as an opportunity for high-quality charters to correct misinformation about how charters are funded and held accountable. YES Prep is partnering with two Houston-area school districts to help educate their students, which it began doing well before the 2017 law. For Catharine Bellinger — vice president of public affairs and advocacy at IDEA, the state's largest charter district — the louder, more organized opposition to charters in Texas cities reflects a growing polarization in national politics. As Democrats swing further to the left, many more are joining progressives who have always seen charter schools as a threat to the public education system. "We have to be even more intentional about clarifying what role we play in Texas education and being transparent about our data and results," she said. IDEA projects enrolling 16,000 more Texas students next year as it continues to expand its number of schools. But for Malfaro, the teachers union president, this is a moment of growing awareness that charter schools have been allowed to pick up steam at an unsustainable rate in Texas. "We've had charter schools in Texas for 20-something years. We're not calling for charter schools to go away," he said. "What we're saying is, we as the state need to answer some tough questions about what the end game is." Disclosure: IDEA Public Schools has been a financial supporter of The Texas Tribune, a nonprofit, nonpartisan news organization that is funded in part by donations from members, foundations and corporate sponsors. Financial supporters play no role in the Tribune's journalism. Find a complete list of them here.